Marvellous weather and glorious sunshine: the weather in South Tyrol will enchant you with more than 300 days of sunshine every year. The Benedictine monks at Schloss Marienberg palace have been responsible for weather record keeping since 1921. Their records show one thing: on average there are more than 300 days of sunshine every year in the Vinschgau region. Spend your holidays on the sunny side of life and make one of the Dolce Vita Hotels your cosy holiday accommodation. Weather in South Tyrol: an all-time high. South Tyrol is the sunniest spot of the Alps! 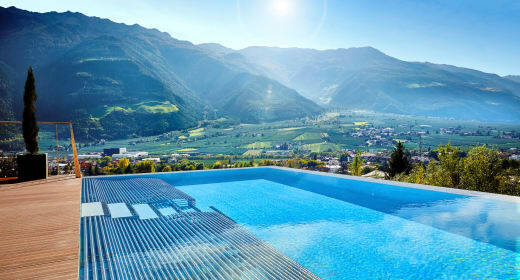 The Dolce Vita Hotels are located in the Vinschgau Valley and Merano region, the sunniest part of South Tyrol. On the rare occasions it does rain in the Vinschgau region, the landscape is clad in lush green vegetation. This mystery is solved when you realise an ancient irrigation system brings water from the surrounding mountains to the valley, making the Vinschgau Valley one of the most beautiful and fascinating holiday regions in Italy. The surrounding mountains protect the Merano region and the Vinschgau Valley from bad weather, turning the region into a unique holiday paradise. Enjoy the mild, Mediterranean climate, blue sky and more sunshine than in Sicily! Spring blesses the Vinschgau region with warmth early in the year and autumns are mild and pleasant. Enjoy the extraordinarily marvellous weather in South Tyrol and experience various opportunities to indulge in sports and day-trips during your holidays in Italy. By booking a room at one of the Dolce Vita Spa hotels you gain access to the amenities at all Dolce Vita Hotels in South Tyrol. Dolce Vita all around - do your body some good by indulging in the various holiday offers and enjoying the fantastic weather in South Tyrol. Numerous sports activities are waiting for you: why not try a cycling tour from your Dolce Vita Hotel to one of the sister hotels? Enjoy the marvellous weather in South Tyrol and treat yourself to a 'Dolce Vita' holiday in Northern Italy. Send a non-committal enquiry to your favourite Dolce Vita Hotel and look forward to indulging in the sunshine of the Vinschgau Valley.